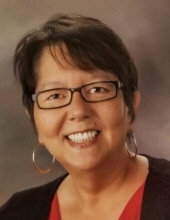 Bonnie S. Campbell, 60, of Rockford IL, died at 9:40 a.m., Tuesday, March 19, 2019 in her home. Born March 25, 1958 in Yokohama, Japan, the daughter of Mr. and Mrs. Donald and Lillian (Oyama) Campbell. Graduated from Pecatonica High School, Class of 1976 and from Illinois College in Jacksonville, IL with a degree in Biology. She was employed as a title examiner by Title Underwriters in Belvidere, IL, retiring in 2018. She was a gifted pianist, an avid reader and enjoyed singing, dancing and gardening. She was a member of the Literary Society in college. Survivors include her father Donald Campbell; sisters Jean (Rick) Campbell-Peterson and Susan (David) Sieveking and close friend Anne Marie Hall. She was preceded in death by her mother. Celebration of Life will be held at 11:00 a.m., Saturday, March 23, 2019 in McCorkle Funeral Home- Pecatonica Chapel, 203 W Fifth Street, Pecatonica, IL. A visitation will be held at the funeral home from 10:00 a.m. to time of ceremony on Saturday. Cremation rites will be accorded. To send flowers or a remembrance gift to the family of Bonnie S. Campbell, please visit our Tribute Store. "Email Address" would like to share the life celebration of Bonnie S. Campbell. Click on the "link" to go to share a favorite memory or leave a condolence message for the family.